Set any healthy eating resolutions this year? Here's a very tasty recipe that's full of vegetables, but also full of flavour. This dish is a delightful side dish, or makes a healthy and filling lunch. Who made healthy eating resolutions this year? I make the same New Year's resolution every year (to eat better), and every year it lasts about two weeks before I give in to the big pile of chocolate that's inevitably been sat there since Christmas. This year I decided to give myself a stricter challenge to help me stick to it - I'm doing vegan January! That means no meat or fish (though I don't eat those anyway), and no dairy or eggs. So far it's going really well and I'm enjoying having to use my head to think up delicious vegan recipes for my blog. 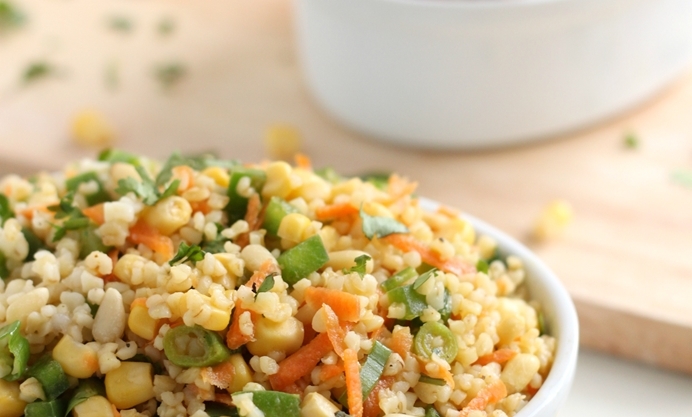 I am beginning to crave a nice cheesy slice of pizza, but the cravings are usually curbed by making delicious vegan dishes like this curried bulgur wheat salad that completely take my mind off anything non-vegan. This salad was the result of a few days of boring lunches (there are only so many times that I can enjoy bread with houmous and salad in a row). I wanted something that was full of vegetables, but also full of flavour, and something that would keep me full all day. 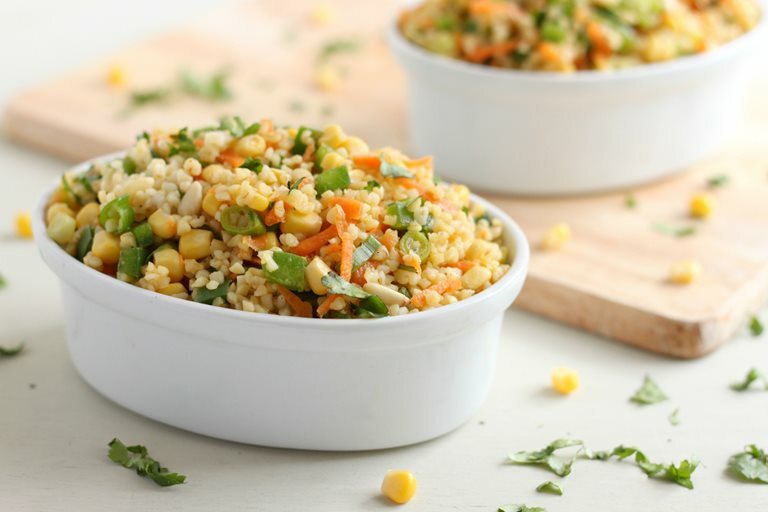 I came up with this bulgur wheat salad that's packed with carrots, peppers, sweetcorn and spring onions, and is dressed with agave nectar (a natural, vegan version of honey) and curry powder. It's almost got a slightly Moroccan feel, so I think a few sultanas would go perfectly in this dish too. This recipe works really well hot or cold, so it's great for packed lunches, or for your main meal of the day alongside a protein - you can even add some chickpeas if you want an all-in-one meal. It was so quick to make, and makes a pretty good sized batch, so it's the perfect thing to make on a Sunday to take for lunch all week long.